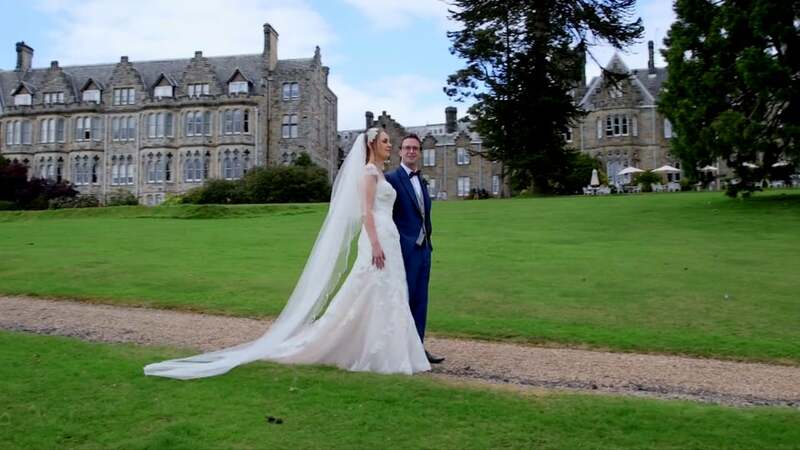 We loved filming Samatha and James’ wedding film at The Ashdown Park Hotel in East Sussex because it is such a luxurious venue. Samantha and James chose the perfect location for their summer wedding. Surrounded by the Ashdown Forest (the woodland that inspired A. A. Milne to write his Winnie the Pooh stories) the Ashdown Park Hotel with its Grade II listed neo gothic mansion house, beautifully landscaped grounds and lovingly maintained secret garden make it a magical wedding venue. Samantha and James couldn’t have chosen better. We will get back to talking about weddings at The Ashdown Park Hotel later, let’s start at the beginning of Samantha and James’s day. Samatha got ready at her parents’ house and then travelled to St Mary’s Church in Westerham with her dad in a gorgeous vintage Rolls Royce provided by Woodward Cars. Not a bad start! Samantha looked amazing in her Essence dress that she bought at Isabella Grace, with her hair done by James Blaquiere and make up provided by Tania Claire Make Up, the effect making Samantha look effortlessly and naturally beautiful. She looked so comfortable as a bride! St Mary’s the virgin Church is Westerham is a pretty church that is rich in history. The earliest parts of the present building date from the 13th century and it has been added to and modified many times over the years. It is believed that there has been a church on this site since the 7th century. So it must have seen its fair share of weddings before Samantha and James’. After a gorgeous ceremony everybody streamed outside for some photographs taken by the very talented Darren Charles Holloway, before heading to the magnificent Ashdown Park Hotel for the reception where Samantha, James and their guests enjoyed a drinks reception on the perfectly manicured lawn. This was followed by the wedding reception which was held in the awe inspiring Richard Towneley Suite which is a converted chapel with spectacular stained glass windows that throw shimmering shades of light across the room. Add to that the original organ, wedding bells and a vaulted timber ceiling and you have the most exquisite wedding venue. It really is a breathtakingly beautiful room and the way that Samantha and James had dressed it with chair covers provided by ‘Chair Cover Chic’, made it so elegant and stylish. Now it’s the little touches at weddings that tell you something of your couples personalities and at Samantha and James wedding I particularly loved the 5 tier wedding cake with lace effect icing (made by those clever people at Sylvia’s Kitchen) The stationery on the tables provided by Elegant Stationery (the book page hearts were gorgeous!) and the love letter mugs with bouquets in. So rustic and chic! The evening reception kick started with a romantic first dance to Nothing’s Gonna Stop us now’ with live accompaniment by the amazing AKA wedding band who made sure the party carried on well into the night. Samantha and James’ Ashdown Park wedding really was perfect. Congratulations to both of you and thank you for allowing us to tell the story of your day.